William Morrow. Collectible - Very Good. NY: William Morrow, 2012. 1st with full number line. Hardcover. 8vo. 381 pgs. Near fine in a near fine dust jacket. Very slight bumping to spine ends. Inquire if you need further information. U.S.A: William Morrow, 2012. First Edition. Hard Cover. Collectible: Very Good/Very Good. Almost new hardback and jacket. Only the slightest wear to the jacket. Text is clean, unmarked. First edition, 1st printing. Full number line: 10 9 8 7 6 5 4 3 2 1 (Shelf location: S) All items carefully packed to avoid damage from moisture and rough handling. Tracking included. 2013-02-06. Good. Ships with Tracking Number! INTERNATIONAL WORLDWIDE Shipping available. May not contain Access Codes or Supplements. May be ex-library. Shipping & Handling by region. Buy with confidence, excellent customer service! U.S.A.: William Morrow. Fine/Fine D. J.. 2013. First Edition.. Hard Cover. 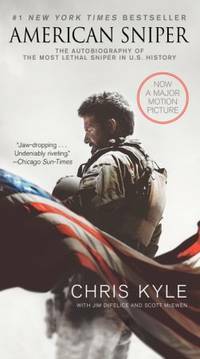 0062290797 American Sniper: Memorial Edition 2013. FINE first edition with fine dust jacket. Size: 8vo - over 7¾" - 9¾" tall . HarperLuxe, 2013. Paperback. New. 9 x 6 cm. William Morrow, 2013. Hardcover. New. 9 x 6 cm. William Morrow. Hardcover. 0062082353 New Condition. . New. Harper. PERFECT PAPERBACK. 0062082361 New Condition. . New. HarperLuxe. PAPERBACK. 0062297872 New Condition. . New. William Morrow. Hardcover. 0062082353 First edition, First printing. Not price clipped. NOT REMAINDER marked. Dust jacket in protective cover. Shipped in a box. Number line starting with a (1). Fine/Fine . Fine. Harper. PERFECT PAPERBACK. 0062082361 Like New Condition. . Fine. William Morrow. Hardcover. 0062082353 Like New Condition. . Fine. William Morrow. Hardcover. 0062290797 Special order direct from the distributor . New. HarperLuxe. PAPERBACK. 0062297872 Like New Condition. . Fine. MONDADORI. Used - Very Good. Former Library book. Great condition for a used book! Minimal wear. HarperLuxe. PAPERBACK. 0062297872 . New. HarperLuxe. PAPERBACK. 0062297872 Remainder mark . Fine. William Morrow Paperbacks. PAPERBACK. 0062376330 . New. William Morrow. Hardcover. 0062082353 First edition, Later printing. Not price clipped. NOT REMAINDER marked. Dust jacket in protective cover. Shipped in a box. Fine/Fine . Fine. William Morrow, 2013-10-15. Hardcover. Good. William Morrow, 2012-01-03. Hardcover. Good. Harper, 2013-01-29. Mass Market Paperback. Good. William Morrow, October 2013. Hardcover . 8.5 Bulk HB Premium. William Morrow Paperbacks. PAPERBACK. 0062431641 Special order direct from the distributor . New. Harper. MASS MARKET PAPERBACK. 0062376578 . New. 2017. William Morrow, January 2012. Hardcover . 7.5 Bulk HB Standard. HarperCollins. MASS MARKET PAPERBACK. 0062238868 Remainder mark . Fine. William Morrow Paperbacks. PAPERBACK. 0062401726 Brand New ,Original Book , Direct from Source , Express 5-8 Business days worldwide Delivery. . New. HarperCollins. MASS MARKET PAPERBACK. 0062238868 . New. Harper. PERFECT PAPERBACK. 0062082361 Like New. Clean, Tight and Neat. Five star seller - Buy with confidence! . Fine. HarperCollins. MASS MARKET PAPERBACK. 0062238868 Brand New ,Original Book , Direct from Source , Express 5-8 Business days worldwide Delivery. . New. William Morrow, January 2012. Hardcover . Good/Good. Good+ Hardcover with Good+ Dustjacket. Light to Moderate soiling and shelfwear to DJ, including a tiny tear. Moderate soiling and shelfwear to covers. Spine ends bumped. Remainder mark on textblock. A few pages lightly soiled. Otherwise, pages clean and tight in binding. Pictures available upon request. A locally owned, independent book shop since 1984. William Morrow Paperbacks, 2013-10-15. Paperback. Good. HarperCollins. Reprint. Biographies & Memoirs. New. Brand New: This item is brand new unopened, never used and still in its original manufacturer condition. William Morrow. Hardcover. 0062082353 Fast Handling - Ships next Business Day!!!! . New. HarperCollins, 2013-01-29. Mass Market Paperback. Used:Good. Suicide of a Superpower: Will America Survive to 2025? Thomas Dunne Books. Hardcover. 0312579977 . Fine. Harper. MASS MARKET PAPERBACK. 0062376578 . New. Harper. MASS MARKET PAPERBACK. 0062376578 Very Good Condition.Access codes and supplements are not guaranteed with used items. No highlighting and No markings.Covers could be repaired or might have self wear sign . Very Good. William Morrow, Jan-12. Hardcover Hardcover. Used - Good. Satisfaction Guaranteed!! Harper. MASS MARKET PAPERBACK. 0062376578 Remainder mark . Fine. Harper. MASS MARKET PAPERBACK. 0062376578 Special order direct from the distributor . New.